It’s exciting to see Tunisian crochet continue to draw interest and new fans. If you haven’t yet tried this form of crochet, I urge you to give it a go. It opens up so many possibilities for new kinds of fabric, shaping strategies and ways to use yarn. 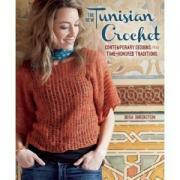 My just released book The New Tunisian Crochet: (Interweave Press) is chock full of stitch patterns – more than 30! — technical tips and tricks, and stunning patterns by the likes of Vashti Braha, Doris Chan, Lily Chin, and Margaret Hubert, and several others, plus my own designs. There are stunning wearables, throws, booties, hats and mitts – really useful patterns that I think you’ll enjoy making, and each design has something to teach as well. For example, with Lily’s Terra Hat and Mitts set you can master Tunisian in the round with a double-ended hook, and Lily’s special technique which allows you to change stitches and colors as you go. Vashti Braha’s breathtaking Rivuline Shawl will change your mind forever on what Tunisian crochet can do — check out these long lacy edges – yes, that is Tunisian crochet! There’s also a fabulous Entrelac bag by Margaret Hubert, beautiful sweaters by Charles Voth and Andrea Gracierena, Doris Chan’s lace skirt worked on the bias, and Lisa Daehlin’s awesome throw. My Lorelei sweater (on the cover) has the look of dropped stitches in knitting, and is worked in vertical rows in a very simple Tee shape, and the Najmee rug is based on a mitered concept that transforms into a star shape, dressed up with exciting colors. One of the things I really enjoyed about writing this book was the opportunity to research stitches from many different sources: I found them in Victorian era needlework encyclopedias, in Weldon’s magazines reprints, in American and British books from the 1970s, and in modern Japanese books. I also included special techniques like short row circles, entrelac, cables, combining Tunisian with regular crochet, and converting knitting stitches to Tunisian. Interweave has done a fabulous job with photos, complete stitch diagrams for all the stitches, and captured the mood and feel of Tunisia in the book’s design. I do believe this book may convert you to Tunisian if you aren’t already a fan, and for those who are, you will greatly expand your vocabulary of Tunisian stitches and techniques. Stay tuned for a Giveaway of Dora’s wonderful new book! My 12 year old is over the moon with Tunsian crochet! Can’t wait for the giveaway! Maybe I can win a book for her. She has been looking for more patterns and projects for this. Taking a class on Tunisian Crochet is one of my resolutions for 2013. Thanks for the post! Please convert me with this book! I’m easy ~ lol. Love, love, love that scarf in the first image! I, too, am just learning basic Tunisian crochet stitches. I’ve been practicing so I can make an entrlac afghan from a pattern I have plus whatever other beautiful things I feel I can handle. I know this book would inspire me. Just signed up for your Crochet Insider newsletter for more helpful and interesting info and plan to try a different yarn hold with traditional crochet. Thanks for all your work to spread knowledge of and joy in crochet.